Microbiology and jazz music aren’t a common duet but for Professor John Postgate they are the two subjects that define his lifetime. John Postgate, brother of Oliver Postgate who created the beloved Children’s shows Bagpuss and Clangers, describes his autobiography as “a book about doing science” and describes in entertaining detail the account of his life in the UK and abroad as he rose to international prominence in the field of microbiology. John has notably contributed to the understanding of key microbiology processes including the sulphur cycle and nitrogen fixation and become well-recognised in the world of microbiology. But John has also become prominent in another field, jazz music, having played cornet over the years with many musicians, some of whom who became prominent names in jazz. John also wrote articles and reviews on the subject, many of which were published in popular magazines such as Gramophone and Jazz Journal. John Postgate’s life is defined by his two great loves: science and music. 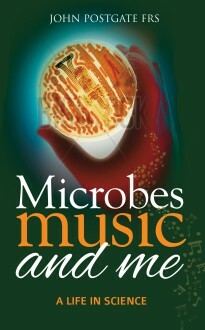 In Microbes, Music and Me – A Life in Science, John looks back on a life filled with a fascination for microbiology and jazz in this entertaining autobiography.